Nature's Heroes - Blog Show the Love reaches all the way to the Prime Minister! 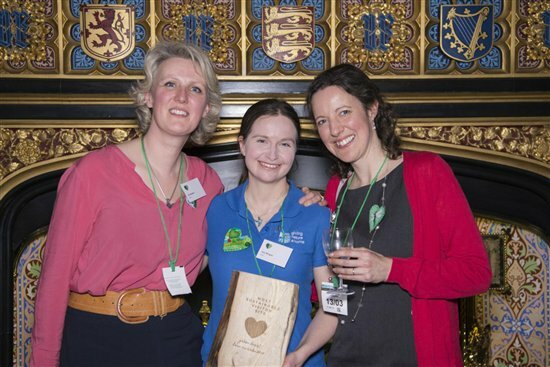 Hosted by Clive Anderson in the spectacular Speaker's House in Westminster on 13 March, the first ever Green Heart Hero Awards have been a huge success! Not only did the Energy Minister Claire Perry attend and give the keynote speech, but non-other than the Prime Minister herself dropped by and met all the short-listed nominees and Award winners. On the left: Claire Perry, Energy Minister, delivers her keynote speech. On the right: Theresa May meets a family from her constituency who were nominated for a Best Green Heart Award. It's brilliant that Theresa May and Claire Perry had the chance to witness, first hand, the passion and enthusiasm of people from across the country, and from all walks of life, who are determined to meet the challenge of climate change head-on, with positivity and optimism about what we can achieve. Izzy Morgan, the reserve warden for Nigg Bay, came all the way down from the highlands of Scotland to receive the award! For more information on the winners and nominees and what they were nominated for, head to the Green Heart Hero Awards website, and prepare to be inspired! Last but definitely not least, there is the Award for Best Green Heart! This went to the fabulous Claire Tinsley, who read about crafting green hearts in Nature's Home, our members magazine! Claire created the stunning hare green heart badge that was sent to Liz Bonnin. Huge congratulations to Claire, and to all the crafters, for help making Show the Love 2018 truly memorable. On the left: Claire Tinsley receives her award from Clive Anderson. On the right: The fabulous heart that Claire was nominated for. A chance to look back at how it all went down this year, here is The Climate Coalitions fabulous highlights film. See what famous faces you can spot. You might even see your own hand-crafted heart! Now it's your turn to tell us what you think of Show the Love 2018! The Climate Coalition would love to hear how you think Show the Love went this year. Please take a few minutes to complete their survey. It helps us to improve, try new things and learn what really isn't working! You are important to the success of Show the Love: your likes, shares, retweets, crafting, and word of mouth are what help Show the Love reach new people, including our decision-makers. So your view on what is working and what isn't is equally as important and we really value your feedback. Many congratulations to all nominees and winners! Credit also due to the PM for taking the time to meet these very special people, something she should continue doing.